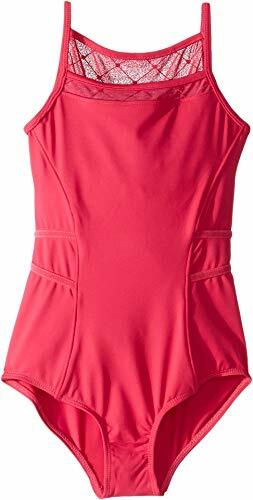 Bloch Kids Size Chart Your little ballerina will glide along stage with grace in the classy Bloch® Kids Diamond Heart Camisole. Athletic cut one-piece is shaped close to the body and allows full range of motion. Slid stretch fibers feature mesh panel along neckline and back. High rough neckline. Spaghetti straps. Princess seams. Velvet crisscross detail along waist. Wide leg openings. 90% nylon, 10% spandex;Lining: 100% polyester. Machine wash, hang dry. Imported. Measurements: Shoulder to Crotch: 21 1⁄4 in Product measurements were taken using size 8-10 Big Kids. Please note that measurements may vary by size. Your little ballerina will glide along stage with grace in the classy Bloch® Kids Diamond Heart Camisole. Athletic cut one-piece is shaped close to the body and allows full range of motion. Slid stretch fibers feature mesh panel along neckline and back. High rough neckline. Spaghetti straps. Princess seams. Velvet crisscross detail along waist. Wide leg openings. 90% nylon, 10% spandex;Lining: 100% polyester. Machine wash, hang dry. Imported. Measurements: Shoulder to Crotch: 21 1⁄4 in Product measurements were taken using size 8-10 Big Kids. Please note that measurements may vary by size. If you have any questions about this product by Bloch Kids, contact us by completing and submitting the form below. If you are looking for a specif part number, please include it with your message.